The RYA South Zone have been crowned 2012 RYA Eric Twiname champions today as their sailors reigned victorious at Rutland Water this weekend (Saturday 12 & Sunday 13 May) as the ‘Battle of the Zones’ came to a thrilling finish. Some 325 sailors in 285 boats representing the nine RYA Zone and Home Countries took to the water in an attempt to wrestle the coveted Eric Twiname Shield from the grasp of 2011 event winners the RYA West Zone - and with dominant performances across all fleets the South Zone walk away proud winners. With a light breeze on the opening day of the Championships (Saturday 12 May), stronger winds gusting a maximum of 15 knots and spells of sunshine throughout today (Sunday 13 May) enabled the nation’s finest Junior sailors to compete in exhilarating conditions out on Rutland Water. 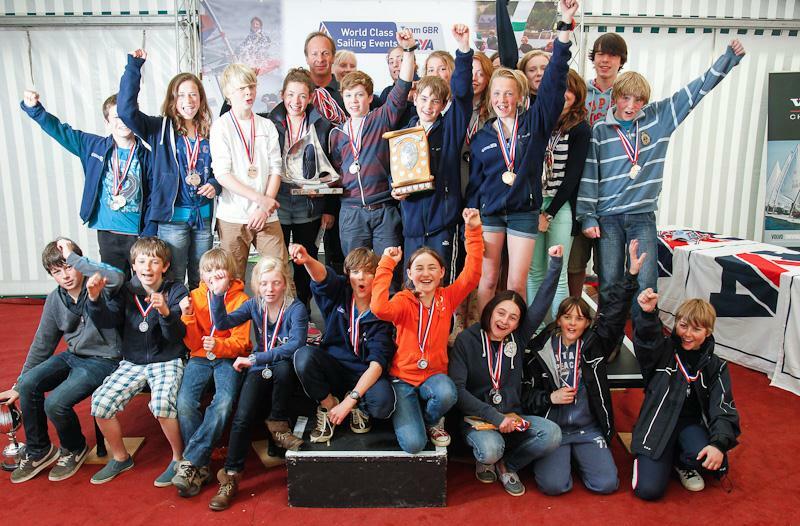 In clinching their prestigious victory the RYA South Zone also won the Eric Twiname Dinghy Trophy, awarded to the Zone performing best from the top two dinghy classes out of the five, while the North Zone for a remarkable third year running retained the Eric Twiname Windsurfing Trophy, awarded to the Zone scoring best from two of the four windsurfing classes. In the single handed classes it was the South East Zone’s Harriet Ward (Queen Mary SC) who dominated proceedings elevating her to the summit of the Topper fleet after scoring a remarkable five bullets across the two days of racing. Optimist sailor Freya Black (Bewl Valley SC) carried on from where she left off on day one, maintaining her position at the top of the leader board and securing event honours for the South East Zone. Adding to the success, the South East Zone was also awarded the top overall Zone in both the Topper and Optimist fleets. South Zone sailors Nick Robins (Hayling Island SC)/Alicia Campbell-Bottoms (Hayling Island SC) leapfrogged the overnight leaders to take event victory in the RS Feva class, while fellow South Zone Squad members Ben Shorrock (Frensham Pond SC)/Tom Bridge (Frensham Pond SC) sailed to victory in the Cadet fleet after an impressive two bullets in the final races of the regatta. In the Mirror fleet, South Zone Squad sailors Jo Kalderon(Itchenor SC)/Sally Lorimer (Warsash SC), who finished yesterday in third, clawed back to claim event honours after an emphatic final race win. The top Zone in both the RS Feva and Mirror fleets was the South Zone, while the South West Zone was the top Cadet Zone. “It feels fantastic to be crowned champion in the Mirror fleet,” enthused Itchenor Sailing Clubs Jo Kalderon. 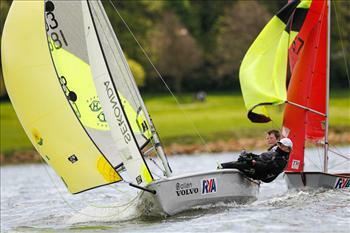 “It’s been a great weekend of sailing with some very competitive racing. Rutland is a really good venue and we love to sail here. It has been quite challenging at times, with some big shifts today, but we have learnt a lot which we can take forward into future regattas. “The table football last night (Saturday 12 May) was also really good fun, we have also met some new sailors from different Squads and made a few new friends along the way which is always nice,” concluded the 2012 RYA Eric Twiname Mirror Champion. South Zone windsurfer Ben Tweedle (Emsworth SC) claimed victory in the Bic Techno 4.5m class, with top prizes also going to Zara Petts (Hssc), Ross Warren (Roseland Waveriders) and Jordan Howram (North Lincs Humberside SC) in the Techno 5.5m, 6.8m and 7.8m event respectively. The top RYA Zone in the 4.5 rig was the South, in the 5.8 it was the South East, the South West clinched the 6.8 top Zone while the North clinched the 7.8 overall Zone. The first part of the selection process for the 2012 Laser 4.7 National Junior Squad was also taking place this weekend at Rutland with Ellie Cumpsty (Chew Valley Lake SC), a member of the RYA Volvo Laser Radial National Youth Squad, taking event honours after discarding yesterday’s 22 and posting two bullets and a third in her three races today. Matthew Whitfield (Penarth/Cardiff Bay YC) finished the regatta two points behind in second while Will Creaven (Cardiff Bay YC) followed in third. Thanks to the long-standing and on-going support of the Eric Twiname Memorial Trust, the event is free to enter with all costs associated with the running of the regatta met by the RYA and the Trust.